This is one of my all-time favorites. It takes a little extra time, but it's not difficult to make and is definitely worth the extra effort. Serve it with a fresh green salad and a nice glass of wine and you have an elegant dinner! Slice each chicken breast horizontally so that you have twice as many pieces that are half as thick. Place flour, eggs, and bread crumbs into separate shallow bowls. Dredge each piece of chicken in flour until coated. Shake off excess. Then dip into egg until coated, then into bread crumbs. In a large skillet, saute breaded chicken, a few pieces at a time, in oil until lightly golden and almost cooked through. Pour some marinara sauce in the bottom of a baking dish (9x13 or larger). Place sauteed chicken in pan. 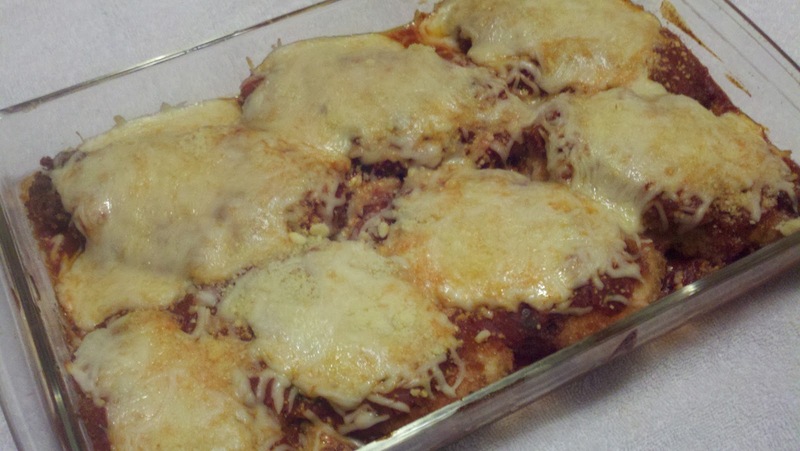 Spoon a few tablespoons of sauce over each piece of chicken and then top with sliced or shredded mozzarella cheese. Bake 20-30 minutes at 350 or until the chicken is done and the cheese is melted and bubbly. I posted this tip with Mom's Chicken Cutlets, but it also applies here: To keep from breading your fingers, keep one hand wet and one hand dry. In other words, dredge the chicken in flour with your left hand and put it into the egg. Then use your right hand to dip it until it's coated with egg and drop it into the bread crumbs. Then use your left hand again to coat it with bread crumbs. Get it? One hand stays wet, the other stays dry. You won't bread your fingers when you bread the chicken.